Vitamin E Intakes and Status in Toddlers, School Kids and Adolescents: What Do We Know? α-Tocopherol, being the most important vitamin E compound within the human diet, is the major lipophilic antioxidant in the cell antioxidant system. Its intake is important from early infancy up to old age. Absence of a clinically overt disease due to deficient intakes of vitamin E makes it difficult to develop intake recommendations for this essential micronutrient. However, this lipid-soluble vitamin is very important during development from infancy to adolescence. 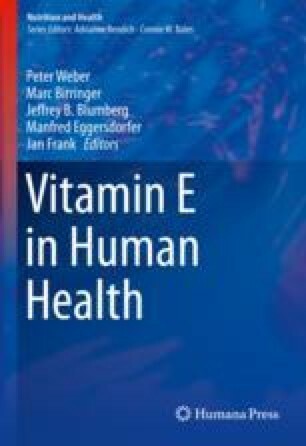 This chapter presents the current situation regarding reference values for vitamin E intake. It also shows published data on vitamin E intake as well as on vitamin E status for toddlers, school kids and adolescents.